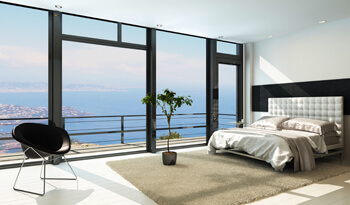 Pleasant, fresh air is intended to create a “feel-good climate” that has to be both without any draughts and noiseless. At the same time, however, economic and visual aspects have to be considered: minimised investment and operating costs are the goal of a hotel operator, while an architect requires the most inconspicuous and subdued air-conditioning components possible, to obtain a harmonious design concept. Hotel guests want above all undisturbed sleep. A real innovation in LTG air/water systems for hotel rooms is therefore the use of induction technology, for example with the specially developed ceiling ­induction concept LTG SilentSuite, providing maximum capacity in a very small space. Top comfort plus reduced operating costs also saves real money at the same time. In addition, attractive and highly convenient LTG air diffusers in combination with air distribution products ensure an agreeable room climate plus energy-efficient operation. The flexible and efficient LTG air-water systems can be used everywhere and can be optimally controlled using matching LTG control technology. The compact ceiling induction unit HFFsuite designed specially for hotel air-conditioning and featuring LTG Induction technology fits even into the narrowest corridor. Since no fan is needed, this concept works practically noiselessly, and thanks to the optimised and very comfortable room flow it complies in the bed area too with Category B as per DIN 7730. The omission of any rotating and electric parts also allows maintenance costs to be reduced considerably and a saving of up to 40 W per room to be achieved. Like the proven fan coil units VKH and VKB for ceiling and floor installatiion, it provides hotel rooms with efficient, comfortable and quiet air-conditioning. For optimum fresh air supply, we recommend visually attractive LTG air diffusers as highly inductive linear diffusers with LTG System clean®, visually inobtrusive swirl/ceiling diffusers (LTG AirPanel) for suspended ceilings, or individualised special diffusers – to match any interior design. Thanks to LTG SystemDesign, all visible floor components are available with the same visual appearance regardless of system. Precise LTG air distribution components such as flow rate controllers VRE/F in round and rectangular designs – also with LTG System ActiveControl and as a dual controller VRD for supply air and return air control in parallel-routed air lines – or pressure controller DRE/F and valves and accessories ensure an optimally matched ventilation system and energy-efficient operation. For special comfort requirements and system solutions, we also offer room flow tests as part of our LTG engineering services.